National Bourbon Day is June 14. (I found that out without the help of my friend @Chef_Jay, although he’s usually my source for “It’s ____________ Day!” knowledge.) This is a day that the Sugar + Shake household feel should be celebrated with gusto. While Shake would happily toast through the day with bourbon alone, I like my booze with a little dessert. 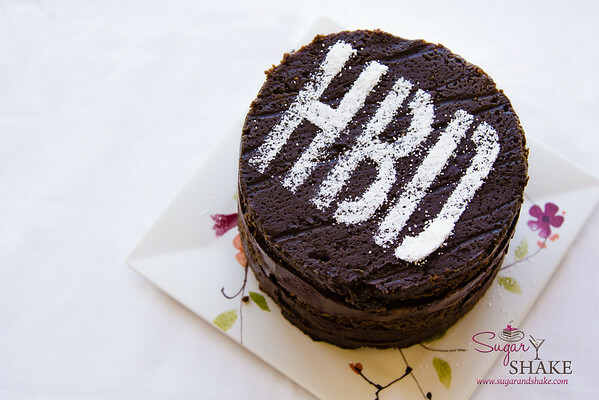 I originally came up with this Chocolate Bourbon Smoked-Tea Layer Cake (based on a recipe from Real Simple) in honor of one of our favorite bartenders, Dave Newman’s, birthday. Dave’s always introducing us to something new at his bar, Pint + Jigger, and whipping up delightful concoctions—he’s one of the handful of folks I’ll trust to make me something with no particular instruction, and I think out of the (I don’t want to say how many) drinks he’s made me, I’ve only not liked the results twice. So for Dave, something special…something boozy…something…bourbon! When I made the cake for Dave, I didn’t have time to shoot the process, nor the final result. (I had about 36 hours advance notice.) But when, about a week later, I found out it would be Bourbon Day soon, I figured I’d re-make the cake, document the process and share it for the special day. 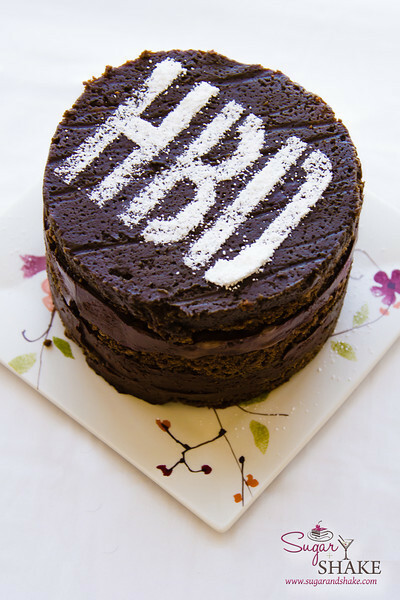 So, Happy Birthday again to our dear friend, Dave, and Happy Bourbon Day to you, dear readers! Real Simple’s original recipe called for this cake to use Earl Grey tea, no booze (crazy people!) and to be baked in a bundt cake pan. I switched up the recipe before, to make mini cupcakes, but this is a really different iteration of the recipe. I kept the chocolate—duh!—and as I did with the cupcakes, swapped the Earl Grey for Lapsang Souchong, which is extremely smoky. The charred flavor complements the bourbon nicely. (Side note: Scotch and bourbon are both whisk(e)y, but I don’t recommend replacing the bourbon with Scotch unless you REALLY are into the peaty flavor. Lapsang souchong tea is already very heavy on the smoke notes; adding Scotch would result in a cake that tastes like burnt bog and chocolate. But maybe you’re into that.) The tea is brewed with 50/50 bourbon and water. I also added some Maui Preserved Vanilla Powder and used kiawe-smoked sea salt in place of regular salt. The batter uses a half-cup of yogurt, which results in a very wet, runny mixture. 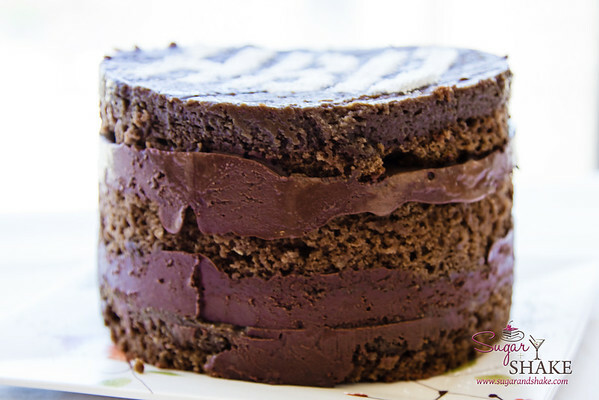 It bakes up into a fairly airy, moist cake, with a top layer that is prone to cracking. It’s a bit of a delicate balance, ensuring that the cake is baked through with no wet spots, but not having fissures all across the top. Check on it as soon as you hit 30 minutes and keep checking every 3-5 minutes thereafter. As soon as the cake is baked through (no crumbs stuck to a toothpick), pull it out. It won’t be the end of the world if you’ve got cracks (you can hide them in the layers), but they make the cake harder to handle when moving the layers. I opted to make this a layer cake instead of the bundt cake presentation of the original. Mostly because I also wanted to add some Chocolate Bourbon Ganache to the thing. Although I originally had a fear of making layer cakes, they’re now a go-to way to impress people. They’re not as hard as they look, but everyone’s pretty damn dazzled by them. Also: ganache. Any excuse to stuff some extra chocolate goodness in a cake, amiright? I’m really glad that Chef Christina Tosi challenged me to take on my first layer cake; I probably never would have attempted one otherwise! The cake goes nicely with coffee. Which should have some extra bourbon added in. Of course. You can use any bourbon you like. I usually bake with Maker’s Mark because it’s good quality (like wine, use something that you enjoy so your dessert doesn’t taste crappy, but not so good that its nuances are covered up and wasted), but not terribly expensive. 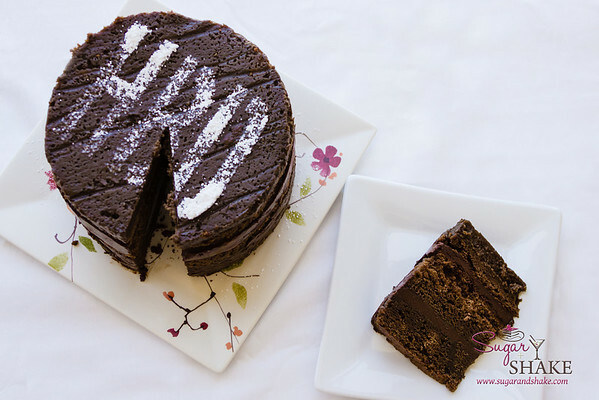 Use something with a nice flavor and not too much of a burn because the alcohol in the ganache and poured on the cake layers does not bake off. Brew tea in water and bourbon for about 5 minutes. Strain out the tea leaves and set aside to cool. In a stand mixer, beat butter, eggs and sugar thoroughly. While the mixer is running, combine dry ingredients (flour, baking soda, baking powder, vanilla powder, salt—if you are using vanilla seeds from a bean, add them to the batter in the next step) in a separate bowl and stir with a whisk to combine. Add melted chocolate to the mixer and beat in. (Add vanilla seeds if using instead of vanilla powder.) 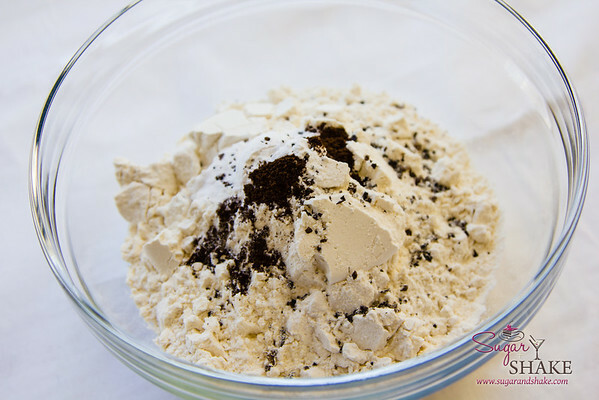 Add dry ingredients in two batches, mixing in between additions. 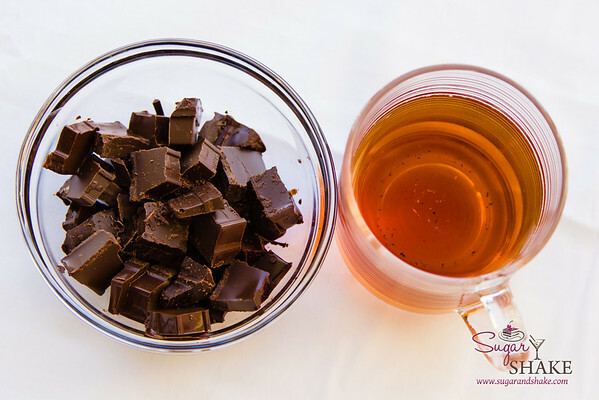 Add yogurt, and when mixed in, stream tea in slowly to avoid splashing. The batter will be very runny and loose. Pour into prepared quarter-sheet pan. Tap pan against counter to even out and remove air bubbles. Bake for 30 – 40 minutes at 350°. After 30 minutes, check doneness with a toothpick. (You should also be able to tell by eye whether the cake is still wet in the center.) Try to remove the cake from the oven before the top dries out too much and develops too many cracks; just be sure it’s baked all the way through. The top of the cake will be puffed up slightly and will appear a lighter brown than the inside. Cool on a wire rack. Combine chocolate and cream in a small saucepan. Heat on low until chocolate begins to melt. 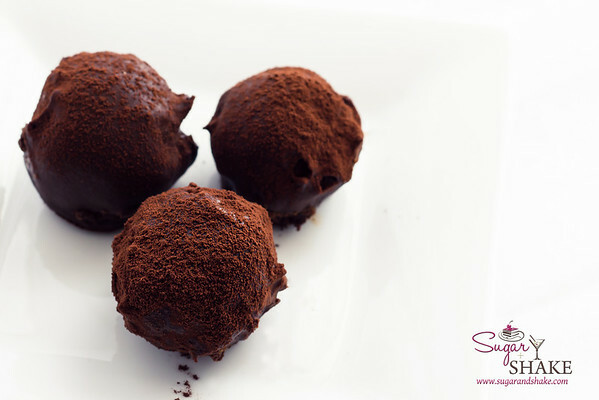 Remove from heat and continue stirring until chocolate and cream are blended together and smooth and satiny in consistency. Add bourbon and stir again. Set aside to cool and thicken. This may take a while. (I have been known to transfer the mix to a glass bowl, cover with plastic wrap and stash in the freezer for 15 minutes to hurry the process along. You’ll need to stir thoroughly again after removing from the chill, if you do this.) 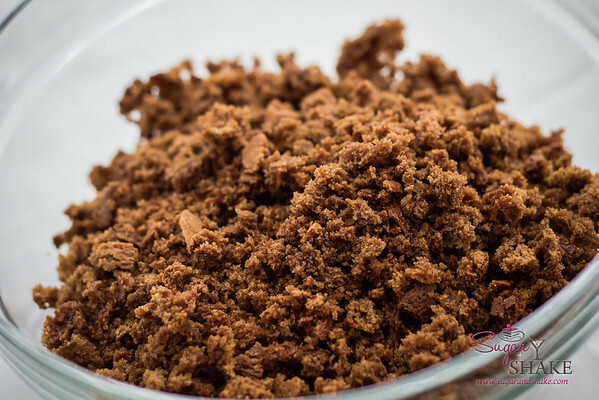 The mixture should be peanut butter-like in consistency; spreadable, but not runny. If it refuses to thicken, try the freezer. If it is too thick (and you haven’t chilled it), add a tiny bit of hot cream and stir. 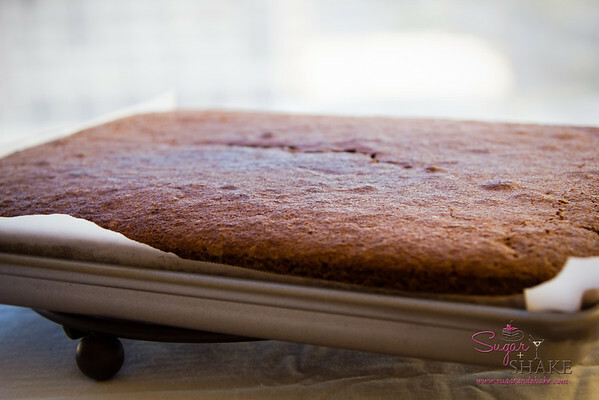 Carefully turn the cake out of the sheet pan onto a cutting board and peel off the parchment paper. The “bottom” of the cake is now the top (which only matters for the very top layer)—it’s a nice, dark brown color as opposed to the drier, possibly cracked, paler brown “top” side of the cake. Using the bottom of your cake pan as a guide (or if you have a pan with sharp edges, you can use it like a cookie cutter), cut out two 6” rounds, and two approximate halves to make a third layer (this will be the bottom layer; you’ll probably end up with a gap in the center of the layer, which should then be stuffed with cake trimmings to make a solid layer—check out the photos from the Momofuku Layer Cake post for examples of the process). Avoid the crunchy hard edges. Set aside the nice circles and pack the partial circles and trimmings into the bottom of the cake pan for the first layer. Pour one ounce of bourbon over the layer. Allow to soak in (it shouldn’t take very long). Spread half the ganache evenly over the layer, edge to edge. Top with the less-nice of your two remaining layers. Use a “collar” of acetate to create a taller cake ring, tucking it along the inside of the cake pan (again, follow the Momofuku Layer Cake photos as a guide) at this point. 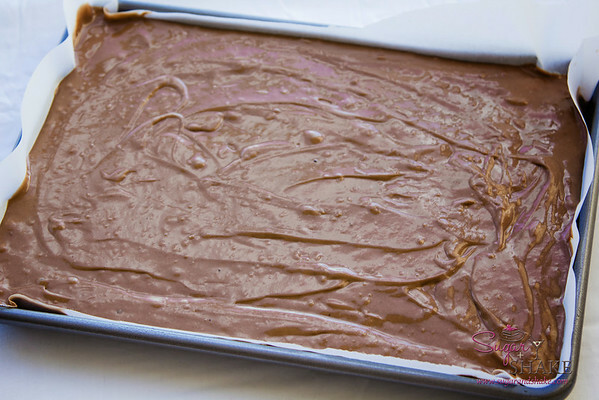 Repeat the one-ounce bourbon dousing and ganache layer process. Top with the final (nicest) cake layer. This layer does not get a dousing of bourbon. Don’t forget to arrange this layer so the flat, darker brown side faces up. Wrap cake (including the cake pan) in plastic wrap and foil and freeze overnight to set the layers. We like frozen cake, so we eat it straight out of the freezer, but I know not everyone likes it that hard. If you’re one of those folks, defrost in the refrigerator before serving. You can leave the cake out at room temp (after defrosting) if you like your ganache less fudgy. 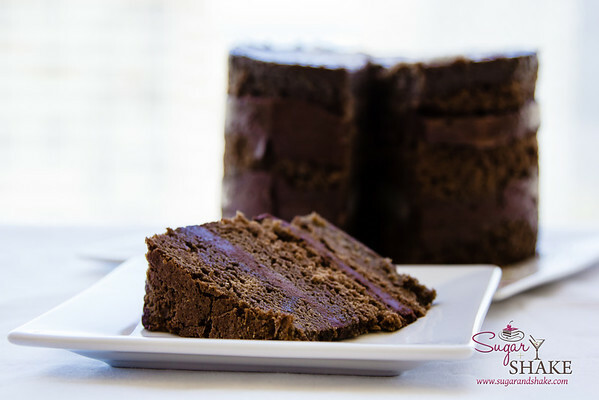 However, if it is very warm, you may find that the ganache begins to soften up too much, which will make the cake difficult to cut. Cheers! Happy Bourbon Day! Let us know how you’re celebrating.